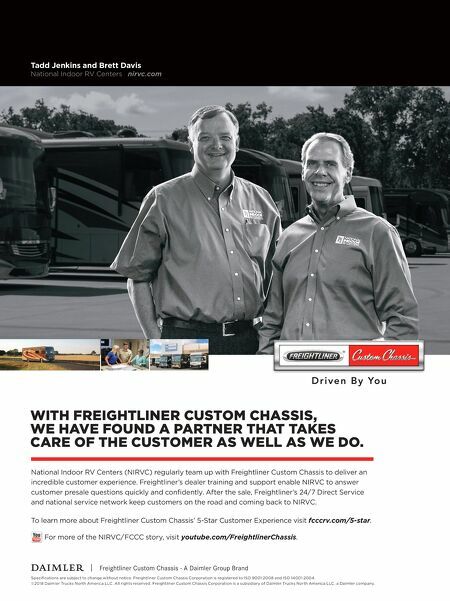 WITH FREIGHTLINER CUSTOM CHASSIS, WE HAVE FOUND A PARTNER THAT TAKES CARE OF THE CUSTOMER AS WELL AS WE DO. 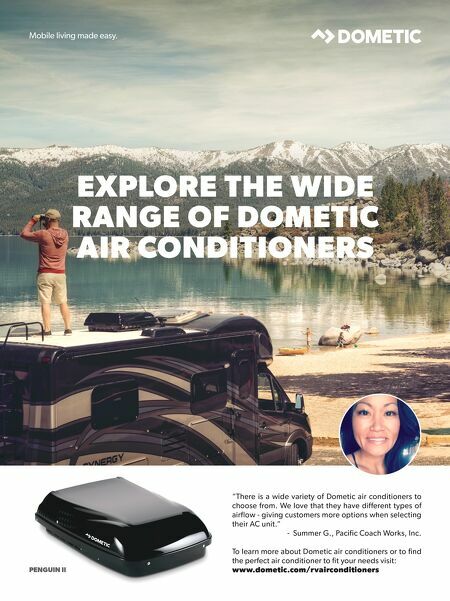 National Indoor RV Centers (NIRVC) regularly team up with Freightliner Custom Chassis to deliver an incredible customer experience. Freightliner's dealer training and support enable NIRVC to answer customer presale questions quickly and confidently. After the sale, Freightliner's 24/7 Direct Service and national service network keep customers on the road and coming back to NIRVC. To learn more about Freightliner Custom Chassis' 5-Star Customer Experience visit fcccrv.com/5-star. Specifications are subject to change without notice. Freightliner Custom Chassis Corporation is registered to ISO 9001:2008 and ISO 14001:2004. ©2018 Daimler Trucks North America LLC. All rights reserved. Freightliner Custom Chassis Corporation is a subsidiary of Daimler Trucks North America LLC, a Daimler company. Tadd Jenkins and Brett Davis National Indoor RV Centers nirvc.com For more of the NIRVC/FCCC story, visit youtube.com/FreightlinerChassis.